Why Is ESPN Doing George W. Bush's Dirty Work For Him? The ill-conceived remembrance is by now as much a 9/11 anniversary tradition as the insensitively branded 9/11 memorial tweet, but even by the degraded standards of the remember-when genre, today’s contributions by ESPN and Grantland are really out there. 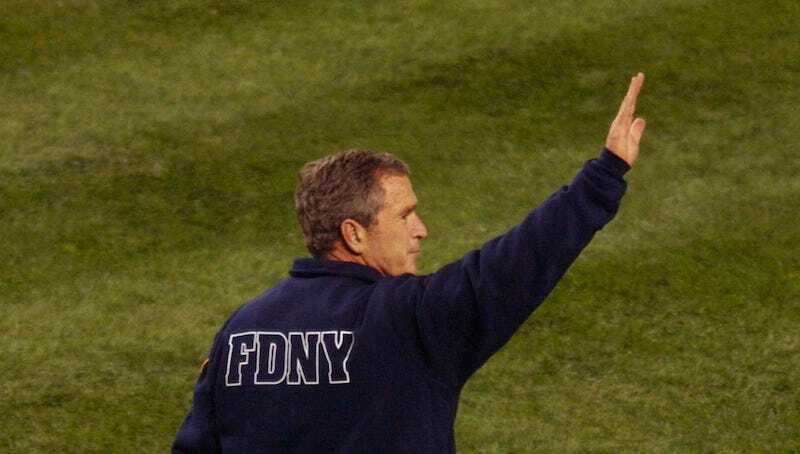 ESPN just released a 24-minute 30 for 30 documentary called First Pitch, which chronicles then-president George W. Bush throwing out the first pitch at an 2001 World Series game in the Bronx, just over a month after the September 11 attacks. The documentary fits right in with much of the media’s recent, puzzling decision to participate in the George W. Bush Image Rehabilitation tour. (9/11 is the tour’s second stop, after that other American city forever changed during the Bush administration, New Orleans.) Through the usual cut-rate documentary methods—wistful, retrospective interviews; orchestral swells—it refashions the largely forgotten act of George W. Bush throwing a baseball as a widely remembered moment of triumph for a reeling country. (The President threw a strike! Take that, terrorists!) This is fine, as long as you’re up to pluck the moment from all context and hold it in your hand like a pretty bauble. Normal here meant warplanes elsewhere. Normal here meant indefinite detention and “enhanced interrogation techniques” in gray territories and secret places. Three weeks earlier, the United States had begun air strikes in Afghanistan; five weeks later, the House Committee on International Relations would draft House Joint Resolution 75, calling on Iraq to allow U.N. weapons inspectors to investigate freely — or else. And what did he think those lessons of 9/11 were? I wanted to know. Angled properly, you can read Thomas’s piece as a wised-up corrective to the embarrassing documentary. Even if you accept that as the case, though, it doesn’t excuse the existence of either. Thomas can throw as many raised eyebrows into this story as she wants to, but those are inherently second- and third-order components of the piece, which was clearly concocted as a means to promote the 30 for 30 documentary, a branding opportunity for George W. Bush where he gets to opine about his Great American Moment without having to worry about being meaningfully checked or challenged. From this angle, Thomas’s subtlety becomes more craven than winking, an acknowledgement of the PR charade that nonetheless manages to dutifully participate in its performance. This isn’t about the author, though, so much as it is about Grantland and ESPN as institutions. The machinations that went into pulling First Pitch together were always going to leave someone—whether from Grantland or elsewhere in the ESPN empire—in the unenviable position of writing a story about George W. Bush without straightforwardly acknowledging that the man belongs in a prison. Undercutting Bush’s faux-heroic bloviating with the faintest of whispers may be the best anyone in such a position can do; not getting into that position at all would be better; and what does the difference matter anyway? ESPN had a story to tell, and it’s not the kind of corporation to let something like the moral issues involved in being deferential to a war criminal get in the way of getting people misty on 9/11.